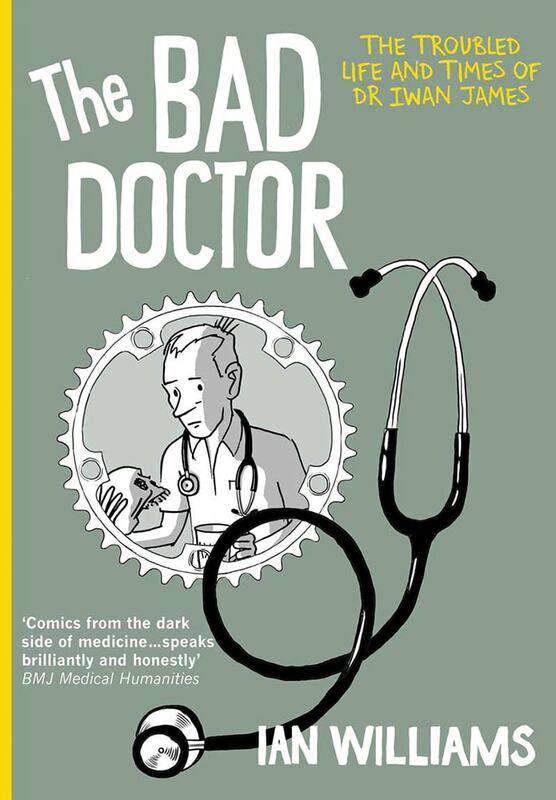 The Bad Doctor is the debut graphic novel by Ian Williams, himself a pretty good doctor, I reckon, by the insight and humanity shown throughout this book. It was published in June 2014 by Myriad Editions and is a beautifully presented book. Ian is a physician working in General Practice and GU Medicine in Brighton. He is also the founder of the website graphicmedicine.org for which he coined the term “Graphic Medicine.” Following his training in medicine he studied fine art and achieved a first in an MA in Medical Humanities. Not unlike the classic graphic novel Maus by Art Spiegelman, The Bad Doctor tells a number of stories simultaneously: that of Iwan James as a GP, Iwan as a sufferer of OCD, and Iwan as a troubled child. We also join Iwan on cycling rides, both alone and with his friend, during which they chew over life’s difficulties. As in Maus, these stories are all related and give the reader an insight into the person Iwan really is. This is what makes the novel stand out and retains the reader’s interest and engagement. Throughout the novel we are exposed to some of the dilemmas and challenges experienced by a GP living in a small rural community and some of the problems experienced when working closely with partners who you can both hate and fall in love with. Relationships with work colleagues are always complicated and emotionally charged and this novel clearly demonstrates this. We see young Iwan develop from an angst ridden teenager who loves heavy metal and worries that his behavior is the cause of certain traumatic events, into a man and a doctor who continues to be angst ridden. He fantasises about shooting himself and becomes possibly impaired by obsessive-compulsive disorder, a trait that somewhat perversely may actually benefit patient care. We witness Iwan struggle with the dilemmas faced by GPs every day, including unpredictable medical emergencies, terminal care, signing shotgun licenses and managing bereavement. He cares about his patients and is naturally empathetic and not afraid to use self-disclosure as a therapeutic tool. Rather like good poetry, comics and graphic novels can convey difficult and emotive subjects in a way that gives the reader a deeper understanding of the message. Explaining what GPs actually do, to our politicians and the media, by our leaders nearly always inadvertently sounds clichéd and trite and seldom succeeds, despite almost all the population having experienced going to the doctor’s at some point in their lives. Perhaps graphics should be used as a powerful political lever in our profession. The monochrome drawings are deceptively simple and the text is minimal. This helps make the book very accessible and a pleasure to read. Each chapter starts with an icon that sets the scene for the following chapter. It would be an oversight not to mention cycling. How many doctors do we all know that cycle or exercise therapeutically, if not obsessively? The benefits of spending time exercising and with friends are so obvious in this novel, that if not already doing so, doctors should be encouraged to start immediately! I also enjoyed the connection between Iwan as an adult and Iwan as a child. Now with access to social media, music streaming sites and platforms such as You Tube, looking back has never been easier, but this novel adds deeper meaning to this and shows how our young lives and older selves are a continuum rather than distinctly separate entities. As a 50 year old, a cyclist and a GP living in a rural community who saw Ozzy Osborne on his first tour, it was impossible not to love this book. Ian Williams has possibly written a future classic, which must surely be added to the curriculum of all GP training schemes and might even help our leaders explain what GPs actually do. Ian, let’s have some more. Tell us Dr Smith’s story.